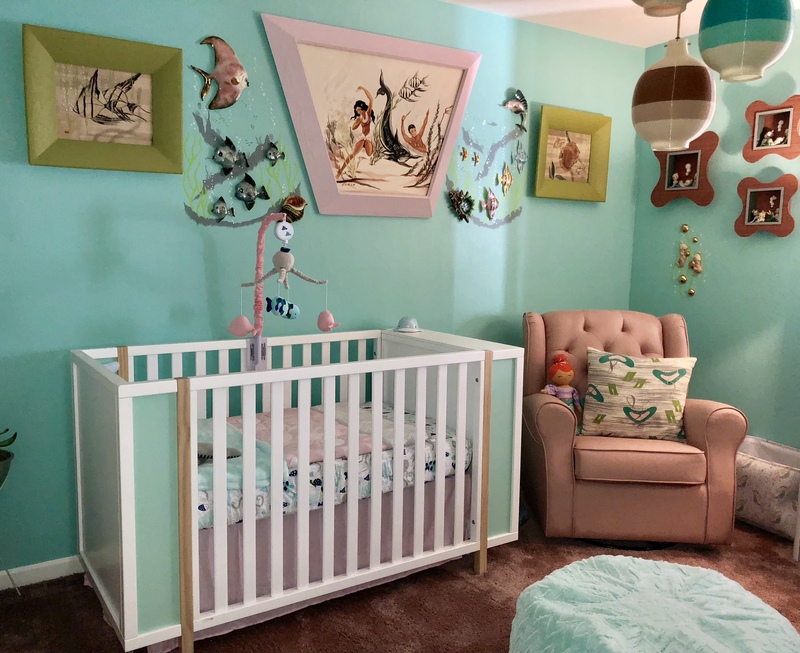 Ever since Mel and I found out we’re having a baby girl, we have worked hard at getting the nursery in order. We decided to name her Autumn, but we didn’t want to use a predictable Autumn theme such as owls, leaves, foxes, etc. 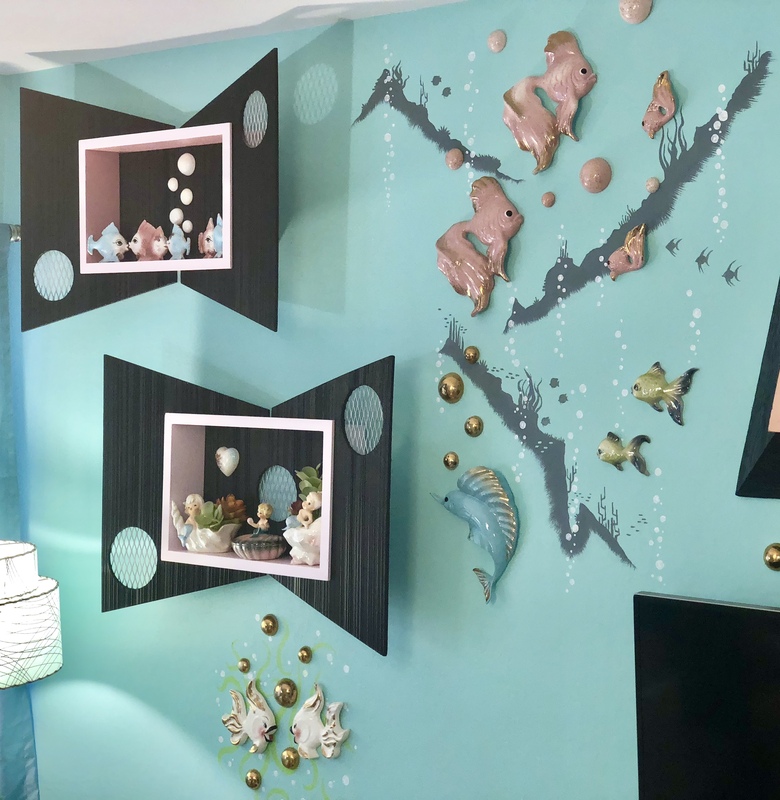 We had an excess of Mel’s fifties ceramic wall fish and mermaids, and we couldn’t find a place for our mid-century Reglor fish lamps, so we decided to do an under the sea theme. 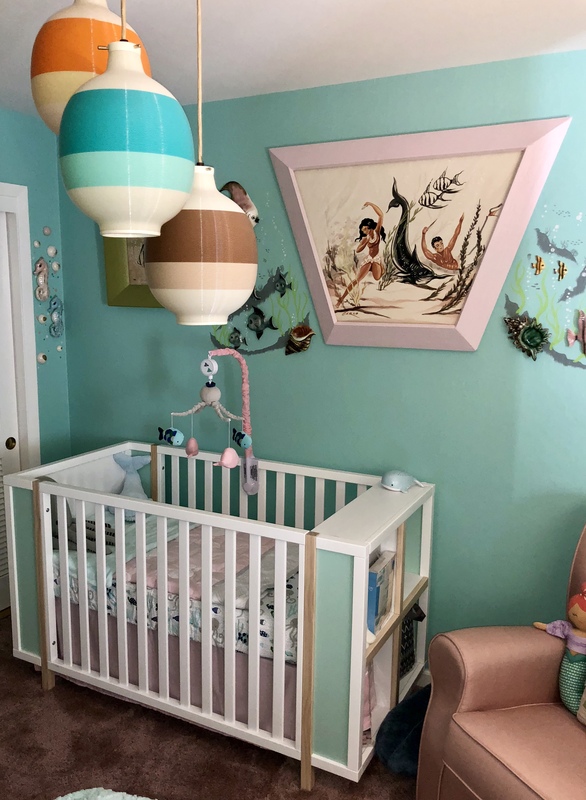 This was not easy to carry out considering most sea themed nursery items are geared towards boys. 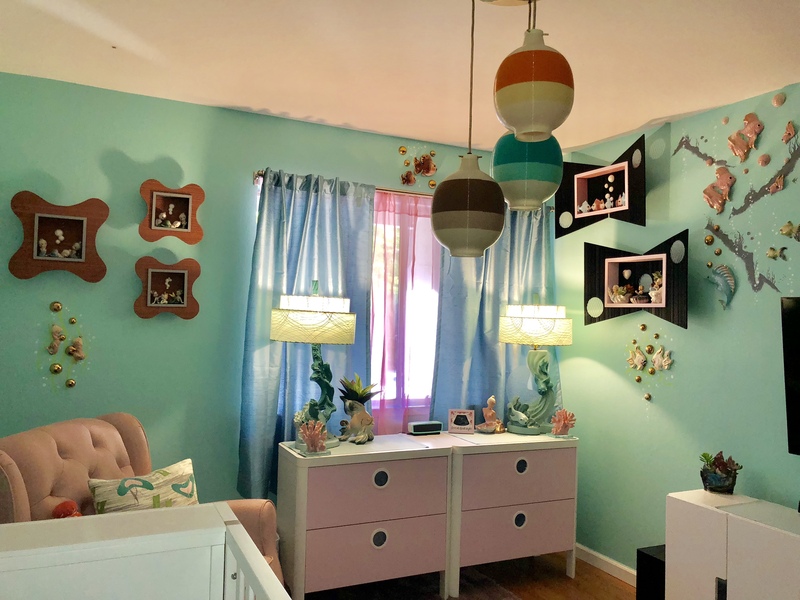 What would our baby nursery be if we didn’t add a Carlo of Hollywood watercolor trio? 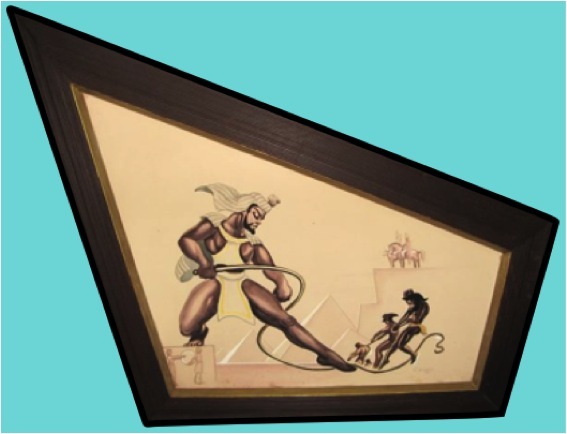 This trio offered a unique challenge because the two smaller Carlo paintings have chartreuse colored frames. This required me to introduce that color throughout the room to tie it all together. 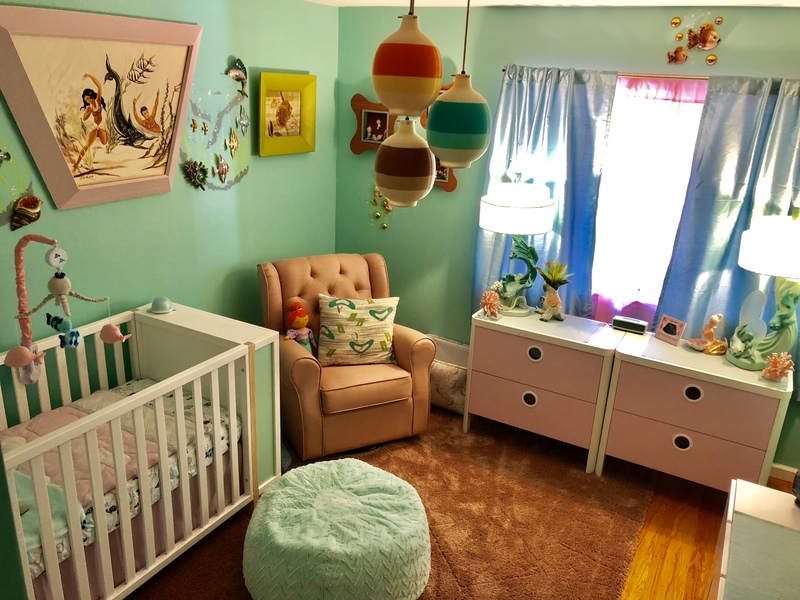 We were more comfortable with using modern MCM style pieces in her room rather than vintage children’s furniture because we had concerns about safety and lead paint. We chose the Babyletto Bingo 3-in-1 convertible crib and storage combo. 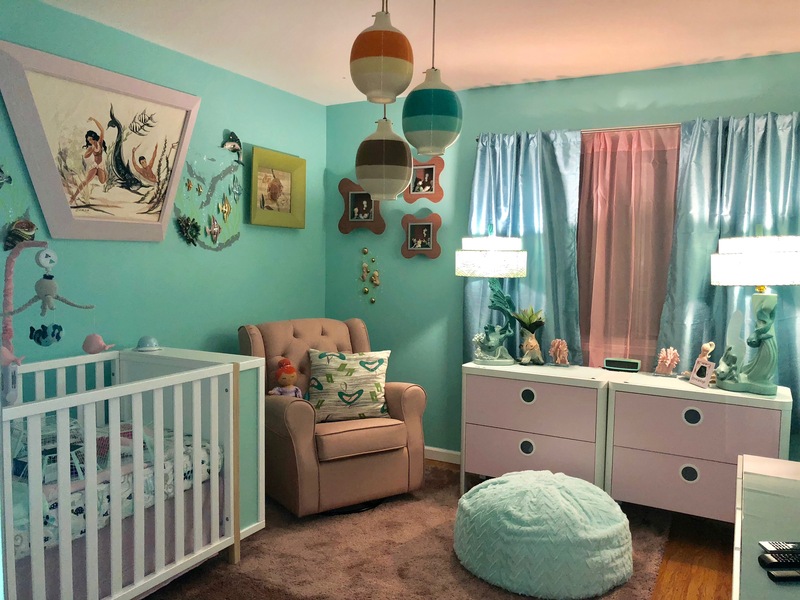 What drew us to this crib is the mid-century style and splash of sea-foam green accent. For seating, we needed something comfortable for the long nights ahead and we knew a wooden rocking chair wouldn’t cut it. Searching online, we came across this blush colored swivel rocking chair by Delta Children. We vintaged up the rocking chair by adding an original atomic barkcloth throw pillow that pulls colors from the room. Believe it or not, the dressers are from Ikea. They are the Busunge style and come in either pink or white. When you purchase them, each dresser comes in two boxes. One box has the frame, and the other has the drawers. 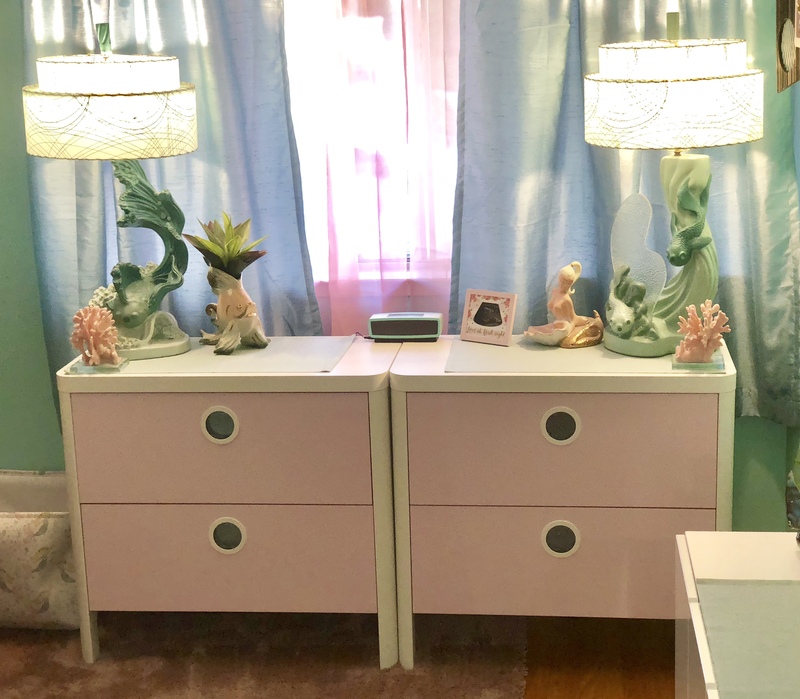 So, we got creative and mixed pink drawers with a white frame. We think it compliments the room nicely. On top of the dressers we have our 1951 Reglor fish lamps. 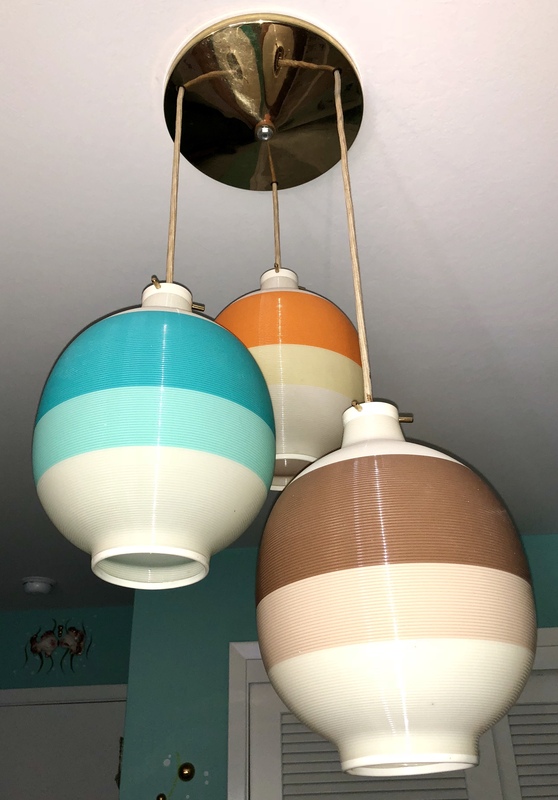 I restored them about five years ago and we absolutely love them. Vintage fish lamps are very hard to find. Continental Art Company made a fish lamp that we’re still looking for. I’ve linked it here. Because we wanted to make the room as atomic as possible, we pulled in some vintage shadowboxes. The first shadowbox on the left has a similar shape to a Carlo of Hollywood frame. It’s a reversed forced perspective style. 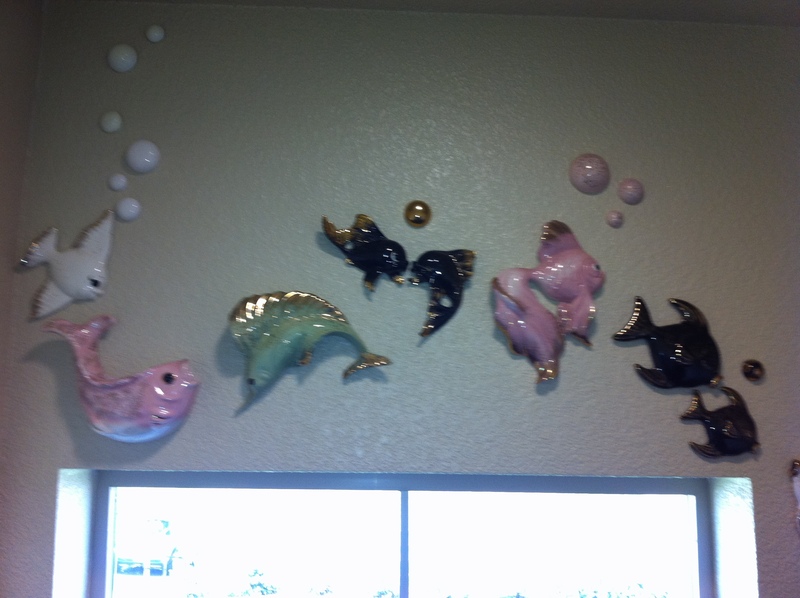 Inside the shadowbox are vintage ceramic mermaids and fish by Lefton, Bradley, Gilner & Relco. 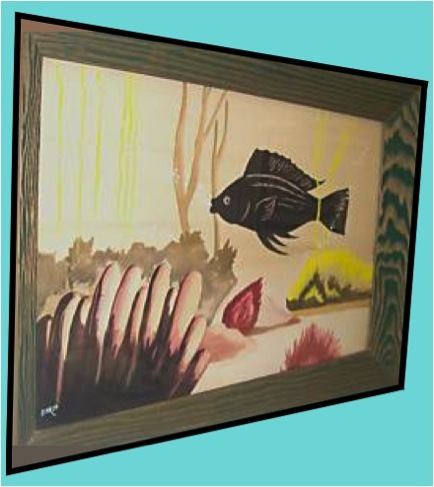 The bowtie shadowboxes have vintage fish and mermaids by Lefton, Josef Originals and Nameth Enterprises. The amoeba shaped shadowboxes contain vintage mermaids by Bradley. We filled in the open spaces above the figurines in each shadowbox with vintage ceramic bubbles. We used museum max to secure them in place so we didn’t have to nail into the shadowboxes. 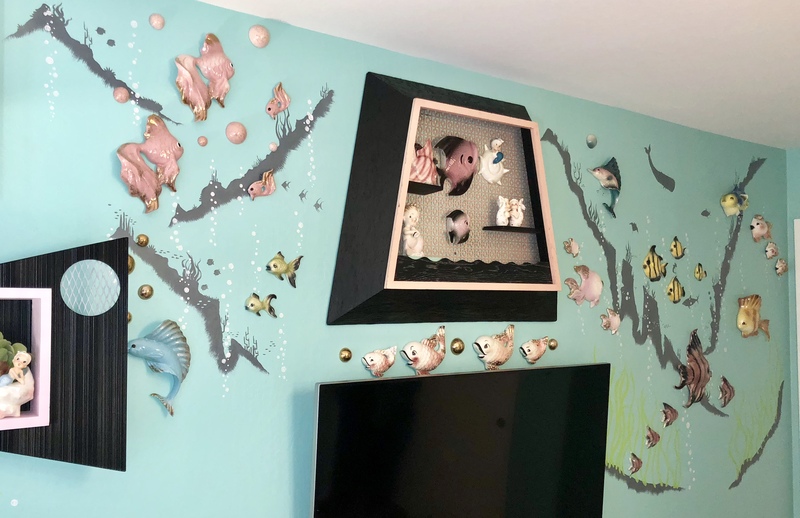 Instead of just hanging Autumn’s vintage ceramic fish on a blank canvas, I decided to paint under the sea murals with mountain silhouettes as the backdrop. The first photo showcases vintage fish and mermaids by Deforest, Norecrest, and Freeman McFarlin. 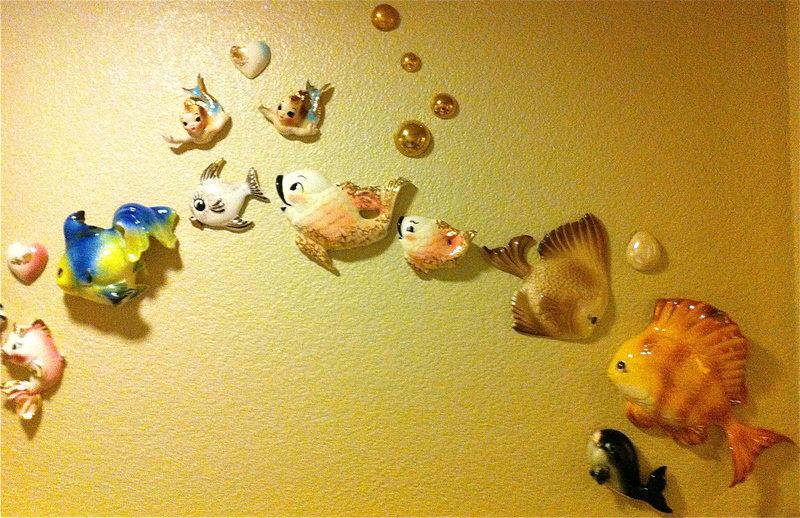 The vintage wall fish in the center photo are all by Freeman McFarlin. The vintage shell in the center photo is just marked Japan. 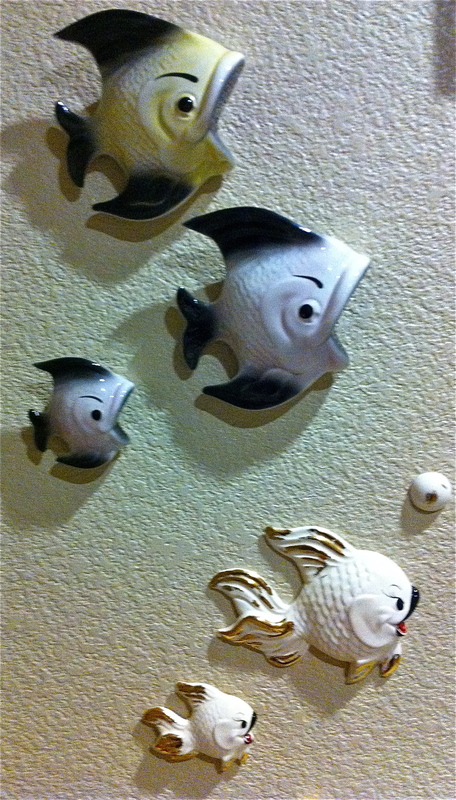 The last photo has vintage fish by Deforest, Ceramicraft and a vintage shell marked Japan. The vintage mermaids on the left are by Freeman McFarlin. The center school of fish are by Lefton. The last photo of the vintage seahorses are by Nameth. 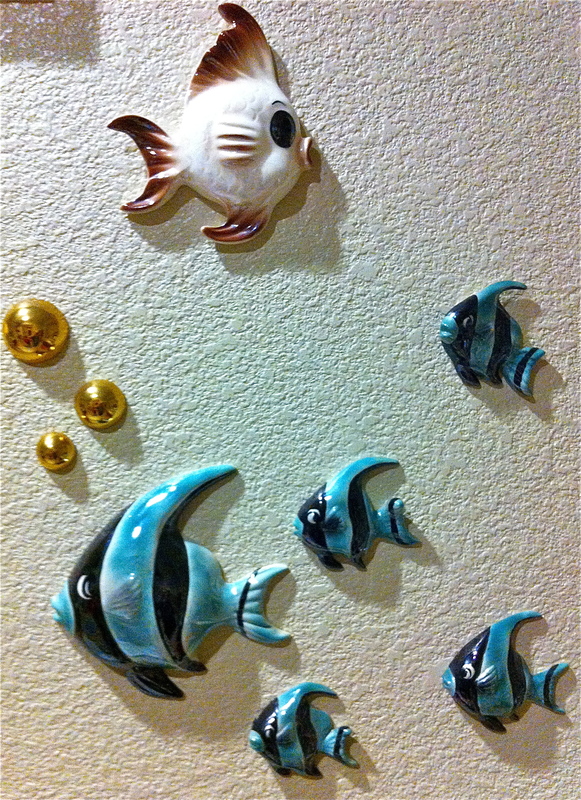 All the above vintage ceramic fish are by Deforest. 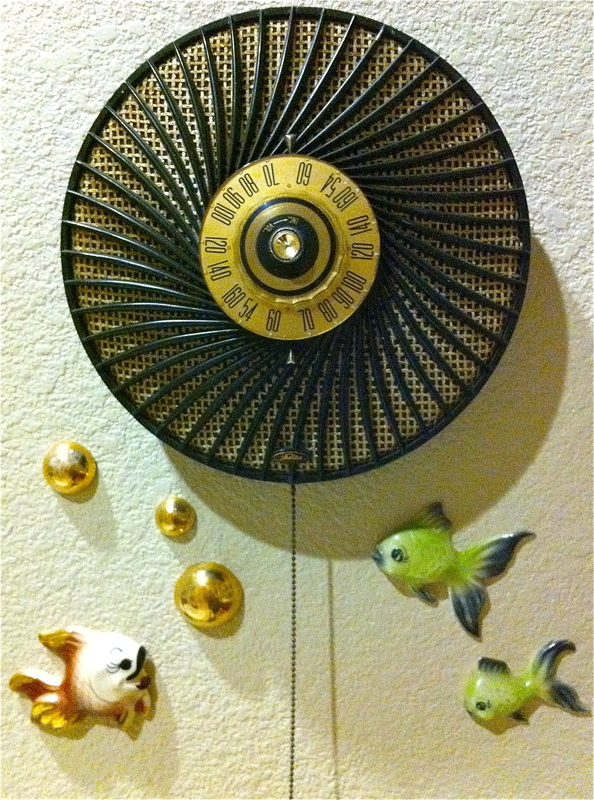 The upper left photo showcases our favorite pink vintage wall fish made by Freeman McFarlin. 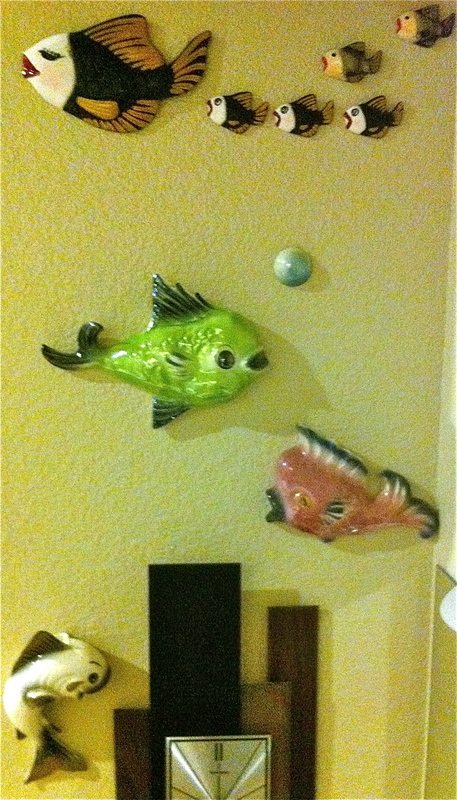 The blue swordfish is also by Freeman McFarlin, and the two small green fish are by Ceramicraft. The vintage angel fish on the upper right are by Deforest. The last photo is a really large mural made up of many vintage ceramic fish by Freeman McFarlin, Deforest and Ceramicraft. We’re really happy with how the room came together. Unfortunately, we don’t think that the photos do the murals justice. Here are some additional photos of the finished room. This vintage pendant light was designed by Heiftez Rotaflex. Milo and Kozmo have taken to Autumn’s new room. 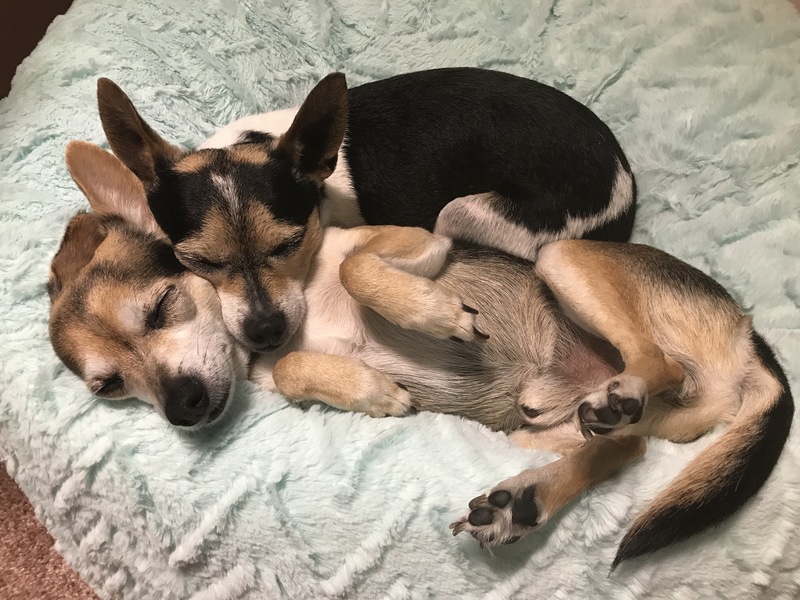 We find them sleeping on her bean bag all the time. Posted in The Makin's Of Our Pad and tagged 1950's fish, 1950's mermaid, 50's fish, 50's mermaid, 50s bathroom fish, atomic ceramic fish, atomic shadowbox, atomic shadowboxes, babyletto, babyletto bingo, barkcloth, Bathroom FIsh, bingo babyletto, Bradley Fish, Bradley Mermaid, Carlo of Hollywood, Carlo painting, Carlo Watercolor, Ceramic Wall Fish, ceramicraft, chalkware, chalkware fish, deforest, delta children rocker, emma delta children, fifties bathroom fish, fifties fish, fish wall planter, fish wall pocket, Freeman Fish, Freeman McFarlin, Freeman McFarlin Fish, Freeman McFarlin Mermaid, gilner, GIlner Fish, Heifetz, Heifetz Rotoflex, ikea, lefton, McFarlin Fish, McFarlin Mermaid, mcm baby room, mcm children's room, mcm nursery, mid century baby room, mid century nursery, Nameth fish, norcrest, Norcrest Fish, Norcrest Mermaid, Reglor, retro baby room, retro nursery, retro theme, rotoflex chandeleir, Rotoflex Heifetz, Shadowbox, Tropic Treasures, Tropical Treasures, under the sea baby, under the sea baby room, under the sea nursery, under the sea room, under the sea theme, vintage baby room, vintage bathroom fish, Vintage Ceramic FIsh, Vintage Mermaid, vintage nursery. Bookmark the permalink. 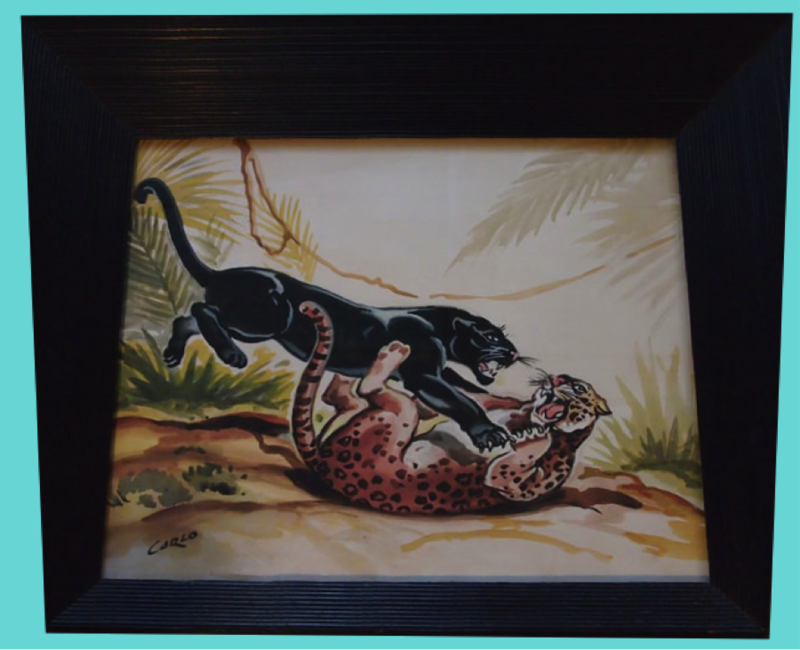 This kitty likes vintage wall fish! So, funny story…..I was hanging one of a hundred fish for Mel when one fell, shattered and stabbed me in the leg while on the ladder. I fell off the ladder and crawled to the nearest first aid kit and put a tourniquet on. I texted Mel while I was bleeding out and advised her that one of her fish had mortally wounded me. Her concerned response was “which fish broke?”. The first time Mel saw a ceramic fish it was at a thrift store. At that very moment she fell in love with those little ceramic pieces of joy! From this point on Mel has spent every waking moment searching on Ebay and antique stores for the little critters. She must have almost 100 of these sea creatures by now. She decided to use our large wall space in the bathroom as her canvas to express herself. It is really hard to find ceramic fish that are not busted and glued because so many of them have fallen and ended up destroyed. 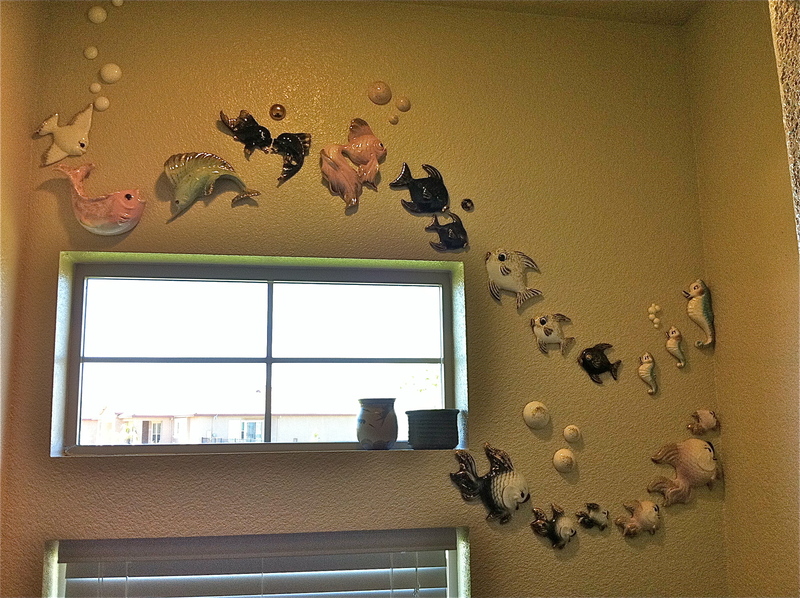 Ceramic fish can run between $15-$300+ depending on the rarity of the fish. A word of advice to anyone thinking of hanging these little guys, when nailing them to the wall make sure you also use wall putty to adhere them to the surface. Mel’s favorite maker is Deforest but she also likes Freeman, Lefton, Bradley and Ceramicraft. 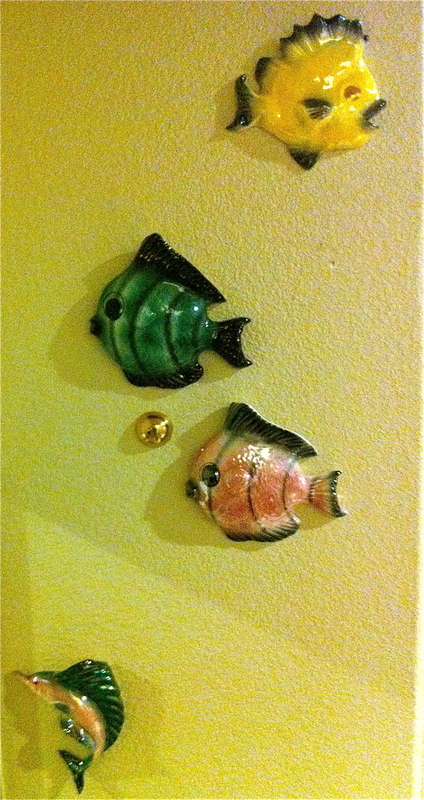 We both agree that the chalkware fish are not as well detailed or as nice. 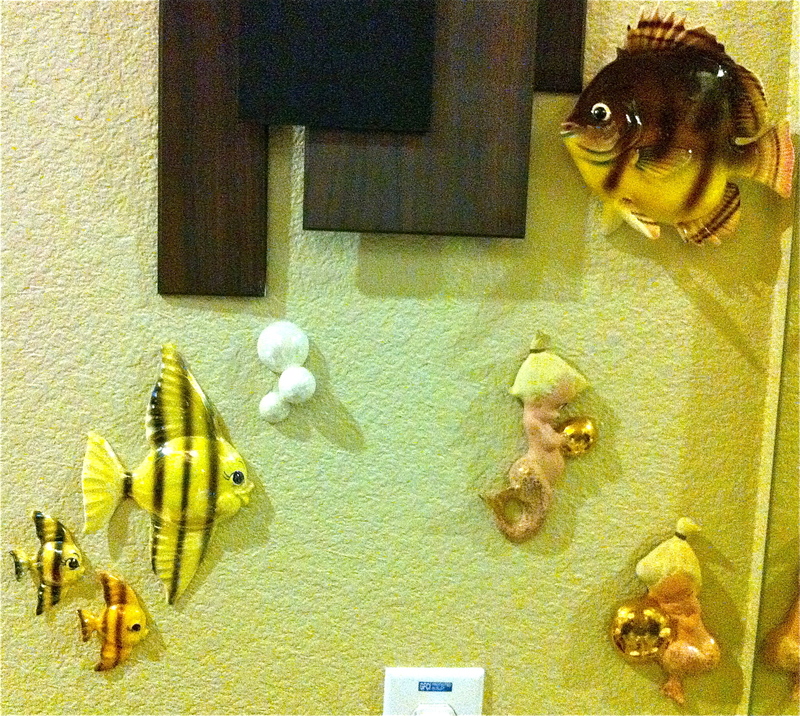 Ceramic fish were really big in the 40’s & 50’s for those folks who wanted to accessorize their bathrooms with something unique. Mel has a really great book that shows a lot of different kinds of ceramic fish and also different makers. 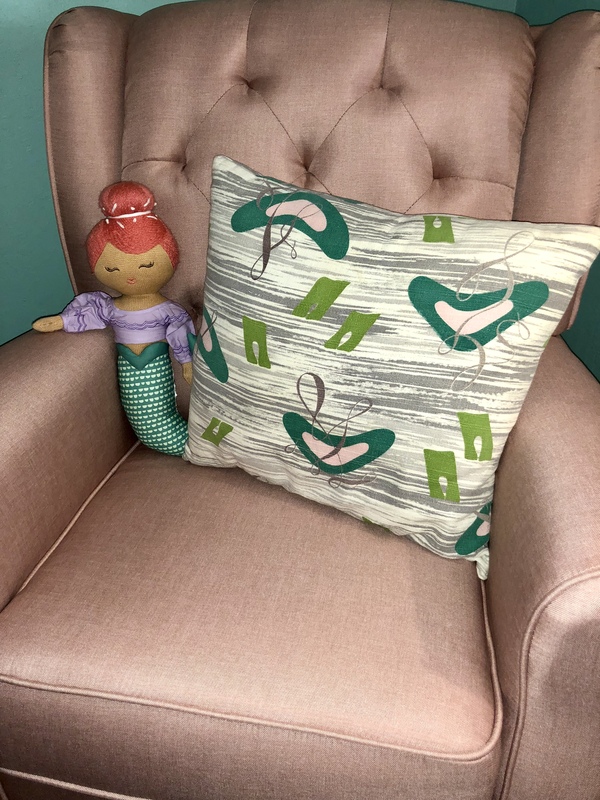 It gives you pricing and also ideas on how to stage your fish (Ceramic Fish, Mermaids & Seahorses: Bathroom Decorations of the 1940s & 1950s). It is really amazing how many of the people we run into in the antique shops collect these. I am not sure when enough will be enough but if wall space is any indicator then we have a long road ahead of us. 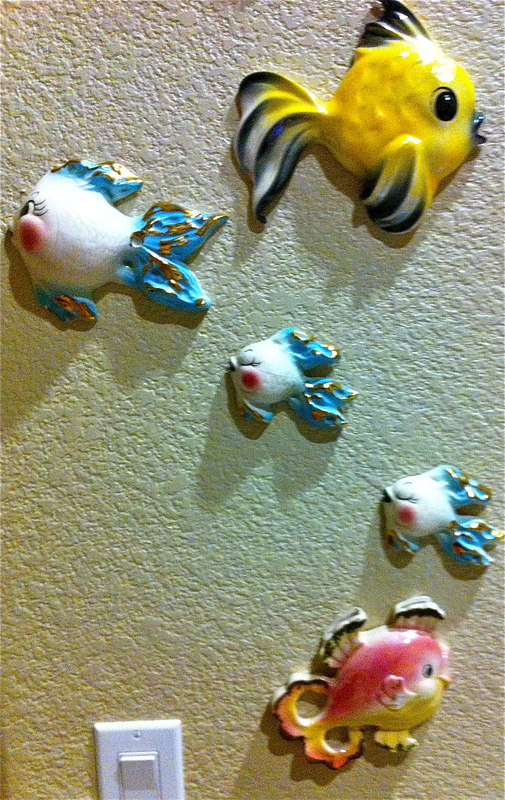 Posted in The Makin's Of Our Pad and tagged 1950's fish, 1950's mermaid, 50's fish, 50's mermaid, ABCO, ALEXANDER BACKER, ALEXANDER BACKER CO, ALEXANDER BACKER COMPANY, Bathroom FIsh, Bradley Fish, Bradley Mermaid, Ceramic Wall Fish, ceramicraft, deforest, Freeman Fish, Freeman McFarlin, Freeman McFarlin Fish, Freeman McFarlin Mermaid, gilner, GIlner Fish, lefton, McFarlin Fish, McFarlin Mermaid, norcrest, Norcrest Fish, Norcrest Mermaid, Tropic Treasures, Tropical Treasures, Vintage Ceramic FIsh, Vintage Mermaid. Bookmark the permalink.